On 17th May 2011 The London Borough of Newham Planning Committee passed a resolution to grant planning approval (subject to entering into a S106 agreement) for Hopkins Architects' designs for the New Stratford Campus Library. The new 3-storey, 4,000m2 Stratford Campus Library building is intended to dramatically improve the Library services, reinvigorate the Stratford Campus site and help raise the profile of the University. 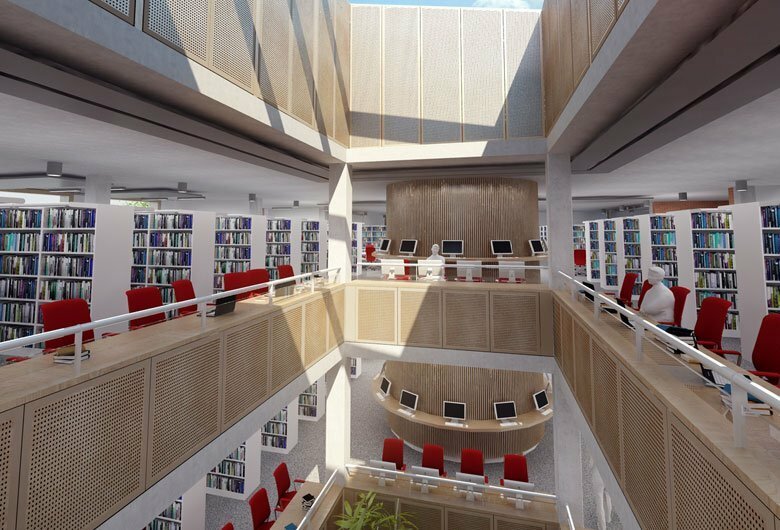 It will offer a wide range of learning environments, including a large social 'hub' at ground floor level as well as space for 130,000 books on the upper levels, for use by the Education, Health & Bioscience, Law and Psychology Schools. The new building has been designed to achieve a BREEAM target of 'Excellent', with roof mounted solar PV panels fulfilling the London Plan's renewables target of a 20% reduction in C02 emissions. Construction is expected to start this autumn, with a planned opening in early 2013.